§ It is an absolute honour for me to be invited to speak to this distinguished group of business leaders this evening. § I want to thank the Business Council on Africa for your kind invitation and, especially, Clive Carpenter for your efforts to bring tonight’s event together. § I also want to thank Rothschilds of London for hosting us in this wonderful venue and all of you for taking the time to come this evening. § Last week, in Paris, I had the opportunity to speak at the Bureau for Public Investment’s BIG Summit of Entrepreneurs about how I am changing the world. I told them simply that I want to change the world by changing the narrative about Africa. Too many people associate darkness, poverty, disease, hopelessness and, of course, safari animals with the word “Africa.” More sophisticated people would add “dependence” to the list. My dream is for people to associate the word “Opportunity” with Africa, for that is also the truth and the potential of Africa. And here is why. § These are interesting times in Africa. The continent has gone from a majority of dictatorships, usually by the military from the 1970s – the 1990s to the democratic, and somewhat democratic, regimes we see today. Many of Africa’s economies have opened up and liberalized to encourage investment and, to a substantial degree, the call has been answered. § You’ve all heard for the last decade that 7 of the Top 10 fastest growing economies in the world are in Africa and the World Bank has said that Africa provides the best return on investment. § But let me take you further back, to illustrate some of the key economic changes that have taken place on the continent. § In the 1990s, with the end of the Cold War and the loss of interest by the two Superpowers in securing the loyalties of African countries, aid flows began to dry up. Along with tighter budgets, a new attitude emerged in the political class to find “African solutions to African problems.” An attitude which, along with key policy reforms relating to commerce, permeated the private sector and created an unprecedented level of growth in multiple economies on the continent. § And the results are measurable. § In 1990, the amount of Overseas Development Assistance (ODA) received by Africa, including through the generosity of the British taxpayer, was $26 billion and Foreign Direct investment (FDI) was only about $1 billion. Intra-African investment was almost negligible. Fast forward to 2013 and we find that ODA received by Africa was $56 billion and FDI was $57 billion. So while ODA has been growing and almost doubled since 1990, FDI which was less than 5% of ODA in 1990, has grown so quickly it has actually overtaken ODA. § Additionally, in 2013, experts estimated that there was $200 billion in private capital on the continent. When ODA and FDI were subtracted, the remaining nearly $100 billion came from remittances for Africans in the diaspora and intra-African investments. § This is very significant. § Africa now has two new massive sources of financing, that barely existed in 1990, to contribute to its economic growth and overall development- and both come from African sources. § Remittances, which have mostly entered these economies informally, mostly went towards food, education, healthcare and SME growth. However, the intra-African investments were largely driven by a new class of home-grown corporates, that have seen tremendous and exponential growth in several non-extractives sectors. - Dangote Cement, formerly an importer of this product now manufactures and distributes it in a dozen African countries. - And the United Bank for Africa, which I Chair, serves 11 million people in 19 African countries. § These companies, among others, collectively represent billions of dollars in annual revenues, millions of direct and tangential jobs, and increasing regional integration. § More importantly, they represent a growing understanding that there is wealth to be made in Africa outside of the extractives sectors and that we Africans represent a market for our own products. § So, there has definitely been opportunity for both foreign and African investors alike on the continent. § However, over the last two years, the African continent has experienced increasingly tough economic challenges, particularly the large economies of Nigeria, South Africa, Kenya and Angola. This is because African economies still rely heavily on natural resources and commodities. § The slowdown of the Chinese manufacturing sector and with it, China’s appetite for purchasing Africa’s natural resources has had an immense impact on the continent. Simultaneously, the exploitation of domestic sources of energy in the U.S. and the re-entry of the U.S. and Iran into the oil market has sent the price of oil plummeting from $114 per barrel to the range of $40 per barrel. § These events have significantly impacted government revenues in many nations. In some economies, like Nigeria, GDP growth has slowed down to as low as 2.2% per annum. § It has surely been a difficult time for Africa, and we still have challenges ahead of us, but we will weather this period. § I am a realist, so I must tell you that Africa remains a good bet for your investment. Even in these times, the economies of Senegal, Tanzania, Cote D’Ivoire and Cameroon are booming, so Africa’s economy does not lend itself to a single narrative. a. Demographics: In comparative and absolute terms, Africa has a youthful population. That means that we are a large market and our productivity potential is high. In fact, with the right policies and investment, Africa is poised to become the engine of global economic growth. Africa also needs to create 200 million new jobs by 2030 to occupy this young population. So, our supply of young people can meet the demand for productivity. b. Increasing urbanization: While this process does come with its concerns, 40% of Africa’s population lives in urban areas and it is happening at a faster rate than other regions. Increasing urbanization means increasing commercial activity in the city and easier markets to reach consumers. c. Technology penetration. The ubiquity of mobile telephony and broadband means makes it easier to reach more of the population, given the spread and infrastructural challenges of the region. The introduction of mobile banking and other smart phone-based services has also brought millions of more people into the formal economy. d. Increased consumerism: Africa’s middle class and its young population have proven to have the purchasing power and a large appetite for goods and services. § These factors along with the rising demand for jobs mean that the smart investor should look to invest in businesses that create jobs and consumer goods and services for less for the purposes of export and more for domestic consumption. I call this Local Value Creation. § Local Value Creation is a key characteristic of Africapitalism, an economic philosophy I developed to enjoin and deploy private sector participation in the development of the continent. Africapitalism asserts that the private sector has a role and responsibility to help develop the African continent through long-term investments in strategic sectors that create economic dividends for investors and social dividends for society. 2. Commit to being in Africa the long haul, because Africa rewards the patient investor. § I know Africapitalism works because I was born, raised and spent my entire career in Africa and I have been very successful adhering to this philosophy. I am invested in the financial services, real estate and hospitality, power, agriculture and health sectors because I consider them to be strategic in that they can help unlock jobs and growth in other sectors of the economy, thereby delivering benefits to the wider society, whilst making profit. § So, companies that are involved in these sectors should definitely come into our markets and partner with local businesses to provide goods and services to our population. Other strategic sectors in Africa include telecommunications, ICT, entertainment, transportation and retail, which will continue to do well even in the current climate. § I believe that Africa’s greatest challenge today is not poverty but the untapped potential of its human capital. I also strongly believe in the transformative abilities of Africapitalism. § I started my remarks saying that I wanted to change the narrative about Africa from “Dependence” to “Opportunity”. § Therefore, I have a responsibility to help create opportunity on the continent, even beyond those inherent in my commercial activities. I believe this can be best achieved by promoting Entrepreneurship. § Promoting entrepreneurship is essential because governments and large corporates do not have the capacity to provide employment for the millions of young Africans entering the job market every year. Therefore, we MUST empower the youth on the continent to create their own jobs and take charge of their futures by starting their own businesses. Many of them are so talented and merely need a chance to take off. They are designing apparel and apps, and educational models and agricultural supply chains, etc. But they are shut out of the formal economy by bureaucratic and regulatory obstacles, policy gaps and lack of access to capital, markets and training. § And after all, what am I but an entrepreneur? § Therefore, I have decided put my money where my mouth is and provided capital, directly and measurably, to nurture the next generation of African business leaders as Africapitalists, through the Tony Elumelu Foundation’s Entrepreneurship Programme. § The programme represents a $100 million commitment to identify, train, mentor and seed 10,000 African businesses over the next 10 years, towards creating 1 million jobs and $10 billion in additional revenues across the continent. The tagline of the program is “Your idea CAN transform Africa.” The documentary you have just watched is the genesis and the gathering of the first class of 1,000 entrepreneurs in the program representing 51 African countries. They also represent the best 1,000 transformative business ideas of 20,000 submissions in 2015. For the Class of 2016, we chose the best 1,000 of a whopping 65,000 submissions. (In fact, I think some of them and their wonderful mentors are here today- please stand up and so we can see you). § We took this route in designing the programme because, as a young African, in addition to having a lot of drive and determination, I was lucky enough to benefit from the guidance of a mentor who tapped into my potential and prepared me for the business world. And when the time and opportunity came for I, and a group of other young bankers, to take over a shuttered bank and turn it around, we found some investors who believed in us. With their support, we not only succeeded in turning it around, we grew it into the United Bank for Africa, a truly pan-African bank with the largest footprint of any home-grown financial institution on the continent, serving 11 million people in 19 countries. § I believe that Africa has the potential to produce 1,000 more UBAs more MTNs, and even our own Steve Jobs through private sector investment. So we made the decision to Institutionalize and Democratize the same ‘luck’ that I had as a young African. The same luck that led me to this moment, by creating a merit-based sustainable empowerment programme that is open to Africans of all nationalities, ages, gender and sectors, all of whom have NO personal connection to me, beyond our common identities as Africans and entrepreneurs. Additionally, we are identifying and advocating for policy reforms in individual countries to enable not just the Elumelu entrepreneurs but all African entrepreneurs to succeed. § So, while I may be the more obvious entrepreneur of choice for a business partnership today, I’m also investing in developing your future partners and it will be a dream come true for me to witness Tony Elumelu Entrepreneurs doing business with British and European investors. § In closing, I want to thank you all again for gathering here today, and for your enthusiasm, as members of the private sector, about the commercial opportunities in Africa. The fact that you have formed a Business Council on Africa is a clear indication that you already believe in Africa. The difference now is that you are dealing with an Africa that believes in itself and is confident about its future. 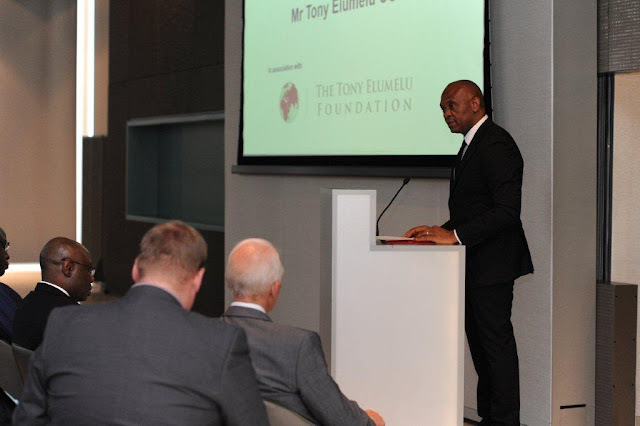 This is a speech delivered by Tony O. Elumelu, CON, Chairman, UBA Plc, Heirs Holdings & Founder of the Tony Elumelu Foundation in London to the Business Council on Africa on June 8, 2016.